How does oppression get replicated in the creative process? What is the importance of authenticity? Who do I speak for? Do they have access to this space? What is my responsibility in the characters that I create? Are they whole people? What is the cost of sharing these stories? As my imagination begins to hungrily call for creative expression, I am once again asking myself many of these questions. 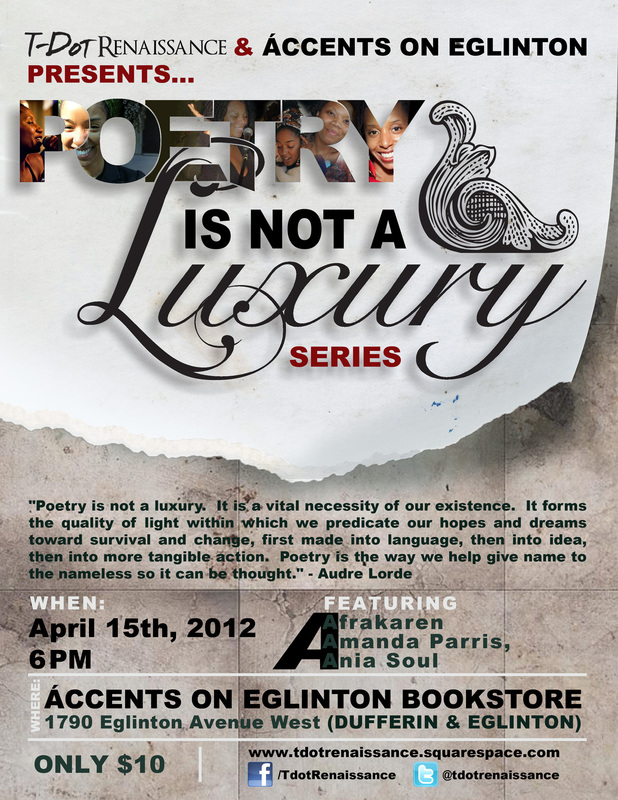 In a couple of weeks, I will be sharing the stage with Ania Soul and Afrakaren at the T-Dot Renaissance Series: Poetry is Not a Luxury being held at Accents Bookstore and as I was reflecting, I realized that these questions are consistently in my mind even when I think about the artists I want to collaborate with; this theme of integrity that comes with the privilege of holding a public stage – what do you choose to say and how do you choose to say it? I collaborate with these ladies and with the artists of T-Dot Renaissance because what they choose to say and how they choose to say it speaks directly to the love, light, pain, joy, beauty, depth, resistance and healing that I feel in my spirit and I hope gets channeled through my artistic voice. “It is essential in critiquing cultural artifacts to look for the manipulation of the medium. What is the ultimate claim of the story? In Birth of a Nation the ultimate claim of the story is, that emancipation was a mistake because black people were incapable of civilized behaviour in all realms. Are the characters well rounded and have strong roles or are they stereotypes? Does the story emphasize the exotic? Which characters hold the foreground of the story? Which characters are merely background? Or are stereotypes to some degree or other. Whose subjectivity is explored? Whose point of view is foregrounded? Does the dominant point-of-view reinforce the ideology of the conventional main-stream view? Which group is the intended audience? Are the characters an upgrading of a traditional stereotype? Or are they fully realized? What is the power relationship between different racial groups of characters? Who gets to speak? Is the traditional non-white voice native, black Latin, East Asian, marginalized? Is the plot constructed to erase the traditionally marginalized and their history and leave the stage or screen to the traditional Anglo-American, and male, hero? Is the story sentimental? Is the medium sentimental? For instance are musicals anything else but entertainments, or as Brecht said, culinary theatre, commercial theatre products, middle brow and suburban? Does it show characteristics and the societal situation in a dramatically revealing light. Is the artwork a sensitive reading of history? Is there equal dialogue and equal exchange among characters given the dynamics of the story. Or is their a racial and conventional hierarchy of voices? When repression, either historical or contemporary is portrayed are the unequal, or repressed characters accommodationist and loyal, or do they, through tone of voice, silent responses or gestures show that disagreement with their powerlessness? Who controls the creation and production and exhibition of the artifact? Does it wrestle with real issues? Does it avoid the real tensions in the story? And if based on true events does it sensationalize and trivialize the personal, emotional and historical record?